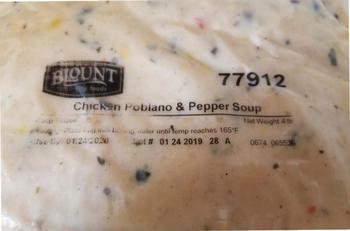 Blount Fine Foods of Fall River, Mass., is recalling an undetermined amount of ready-to-eat chicken soup. The recalled product, bearing establishment number “EST. P-19449A” inside the USDA mark of inspection, was shipped to restaurant distributor locations nationwide. Customers or restaurants who have purchased these products should not consume or serve them, but discard or return them to the place of purchase. Consumers with questions about the recall may contact Blount Fine Foods at (866) 674-4519 or by email at recalls@blountfinefoods.com.